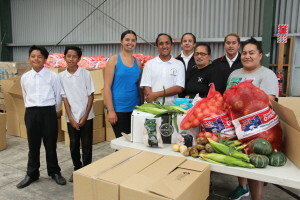 Te Matatini’s major sponsors, Bostock New Zealand and Mr Apple have donated a huge amount of produce to feed the masses. Bostock New Zealand is providing an unlimited amount of squash and onions as well as giving corn, potatoes, Bostock’s Organic Free Range Chicken and Rush Munro’s Ice Cream. Mr Apple has donated an unlimited supply of apples for the festival. The two leading growers have also donated the use of their new Henderson Road Coolstore to store all the fresh produce and box up the donated goods for the different marae’s around Hawke’s Bay. Team Leader, Maku Huataropitini who has been responsible for coordinating the food distribution to all the maraes from the cool store, says Ngati Kahungunu is very grateful for the generous contribution, which helps to make the festival posiible. “It’s awesome to see so much generosity from Hawke’s Bay growers. Everyone is coming together to make the Kapa Haka festival an incredible event. Bostock New Zealand Owner, John Bostock says he is proud to sponsor Te Matatini and provide an unlimited amount of fresh produce for the event. “The Kapa Haka Festival fits well with our company values and philosophy. We grow healthy, superior tasting produce and have a proud history of sustainable production. Bostock New Zealand grows, packs and markets high quality squash, onions, grain and organic apples and employs up to 800 staff in the peak of the season. Scales Managing Director Andy Borland says Scales and Mr Apple are very pleased and excited to be a supporter of Te Matatini and the Taniwha-Dragon Economic Summit.